The team leapt from a helicopter 4,000 feet above the city of angels and dove down at more than 120 mph in custom wingsuits, Red Bull said. 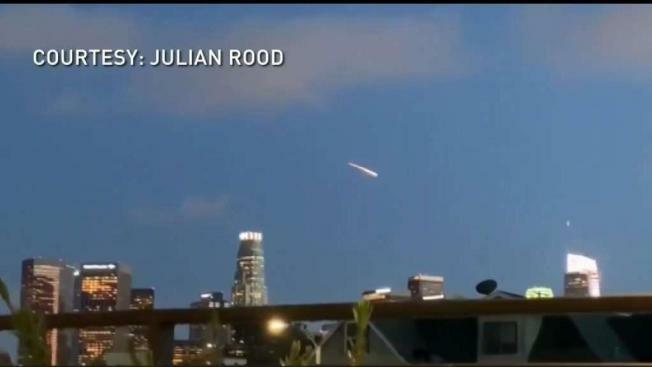 A bright light over downtown Los Angeles Wednesday night that had people around the city wondering if a meteor or aliens were descending on Southern California turned out to be a stunt by Red Bull Air Force to celebrate the final supermoon of 2019. "As the third and final supermoon of 2019 rose over the iconic Los Angles skyline, the Red Bull Air Force – a team assembled from the most accomplished and experienced skydivers in the world – marked the occasion as only they can: springing into the air to get an up close and personal look at the phenomenon," the company announced. The team jumped from a helicopter 4,000 feet above the City of Angels and dove down at more than 120 mph in custom wingsuits, Red Bull said. This was the first wingsuit jump into downtown LA, according to Red Bull. The Los Angeles Police Department took to Twitter to calm public fears, "PSA: A meteor did not crash into Downtown Los Angeles, and no, it's not an alien invasion...just a film shoot. This is Tinseltown after all."